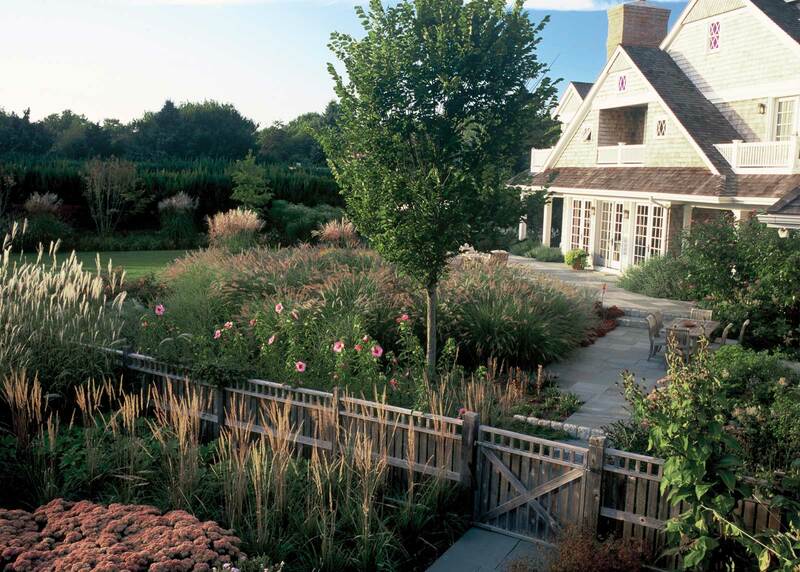 The two-acre garden of this traditional shingle style house is the result of a collaboration between landscape architect and architect. It is a departure from the manicured style for which Southampton is known. Lawn is used sparingly, covering only 15% of the site, just enough for recreational space for dogs and grandchildren. 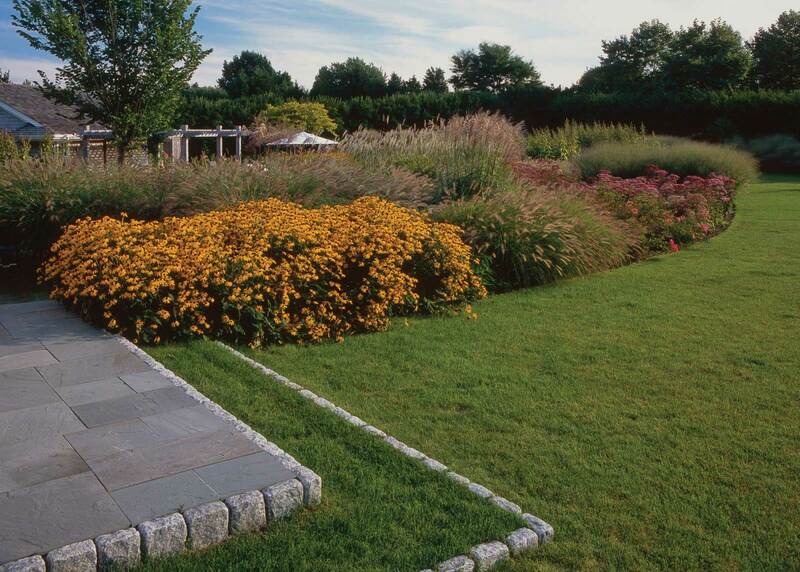 A stark contrast to most of the neighboring properties, the minimal lawn reduces the property’s run off. 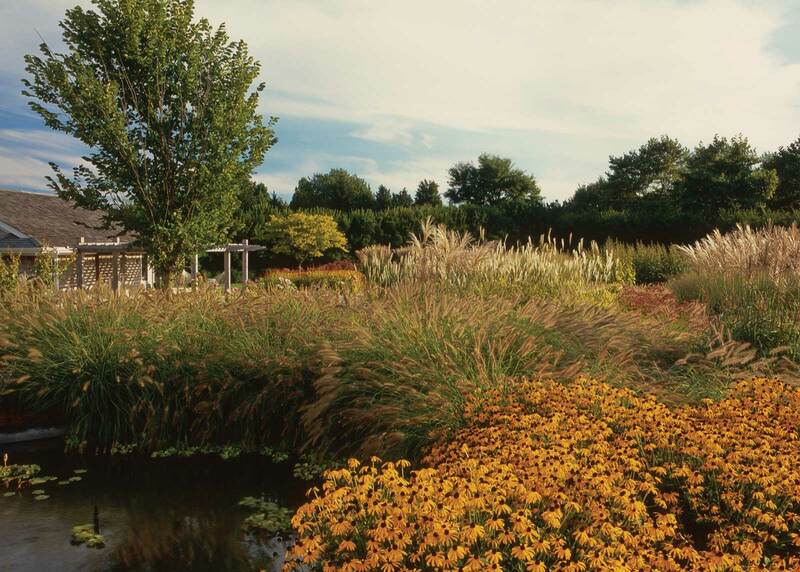 Conversely, the site’s densely packed perennial massings, comprised mostly of natives such as black-eyed Susan, anise hyssop, and fleece flower, act as a massive rain garden and absorb the majority of the site’s stormwater. The ubiquitous privet hedge, usually meticulously clipped, is allowed to grow in this garden. The white blooms that appear on the hedge are a frequent conversation starter – most hedges are sheared long before the blooms announce themselves in late summer. Though naturalistic, the areas close to the house are designed to maintain a sense of structure and relate to the home’s interior. An entry garden frames a bluestone path from the forecourt to the house. 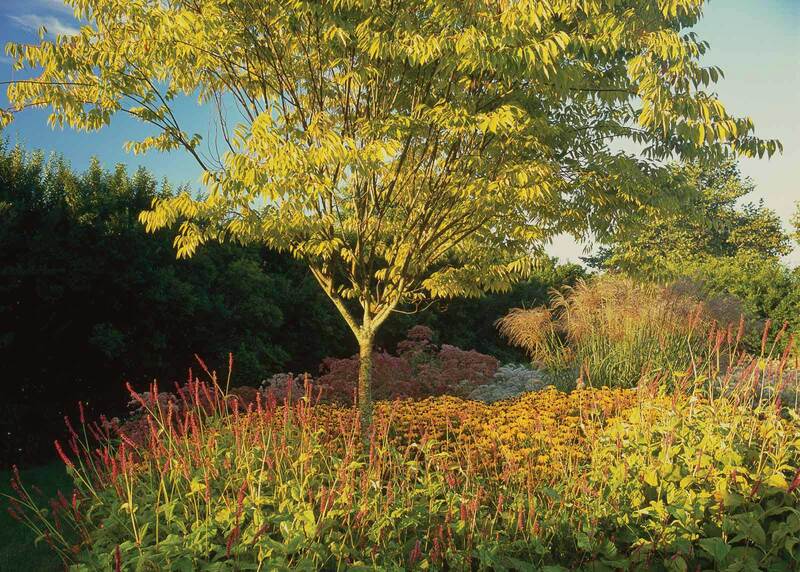 Specimen trees on either side of the path punctuate masses of evergreens and a sea of groundcover. A bluestone terrace adjacent to the living room serves as the primary entertainment space. 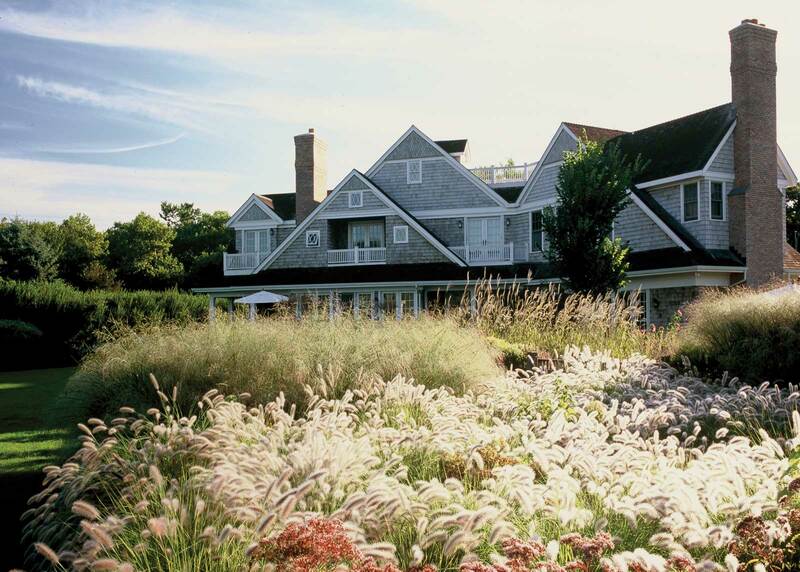 However, the gardens transition from cultivated to wild as they extend away from the house. 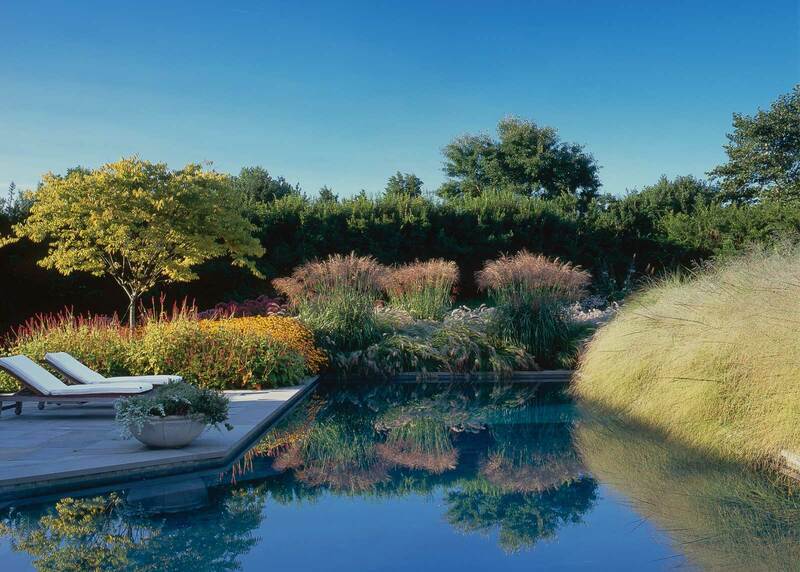 Switch grass, fountain grass, Lady Baltimore hibiscus, and butterfly bush buffer the swimming pool in untamed masses. The pool – a generous 20 x 60 feet – includes a lap pool, seating alcove, and shallow wading area for the owner’s grandchildren. The ocean, just two blocks away, is interpreted further by a lily pool off of living room terrace, which reflects the late afternoon sun into the house.